With gorgeous parks, trails and picnic tables everywhere you turn, Lake Lure & the Blue Ridge Foothills was simply made for dining al fresco! It is one activity that can take minimal planning and be put together on the fly. Whether you’re here for a day, weekend or week, consider changing things up a bit by weaving a picnic into this summer’s travel plans. To help you decide where to set up your blanket, hammock or basket, we’ve rounded up some of our best picnic spots, along with a list of places to pick up the necessities if you’re short on time or just prefer to spend more time enjoying the scenery. Crestview Park – Located just one mile south of this charming small town, Crestview Park is the ideal spot for taking your picnic from a simple lunch outing to an all-day affair. It’s a 26-acre, multi-purpose park that contains several ball fields, two playgrounds, a picnic shelter, a lighted walking trail, basketball courts, tennis courts, and horseshoe pits. Local’s tip: The town does rent out the picnic shelter so if you have a large group you’ll need to reserve the picnic shelter. Otherwise, it operates as a place to escape the heat and sit down and eat a bite in the shade. The shelter includes a charcoal grill, lights, and four electric outlets for your convenience. Purple Martin Greenway – Across the street from Crestview Park is Rutherfordton&apos;s first natural trail system! 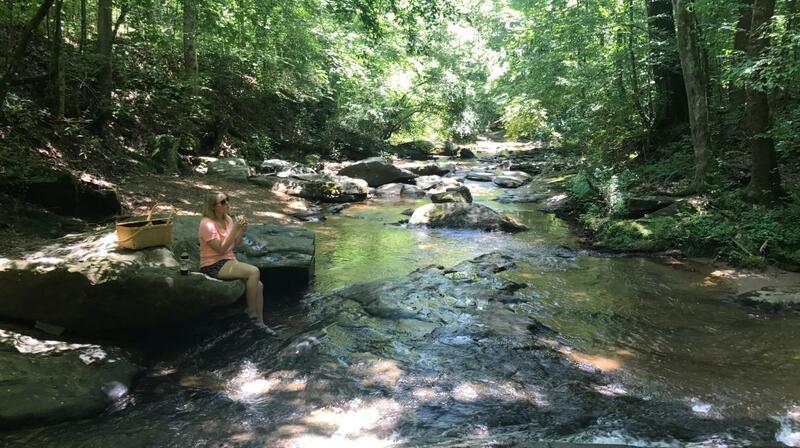 Here, you can enjoy your picnic lunch while you explore wildlife, creeks, waterfalls and local plant life. The trail is bike, kid and pet friendly, as well as handicap accessible. Local’s tip: The picnic shelter operates just like the one mentioned above at Crestview Park. So if you are planning a party, reserve ahead of time. 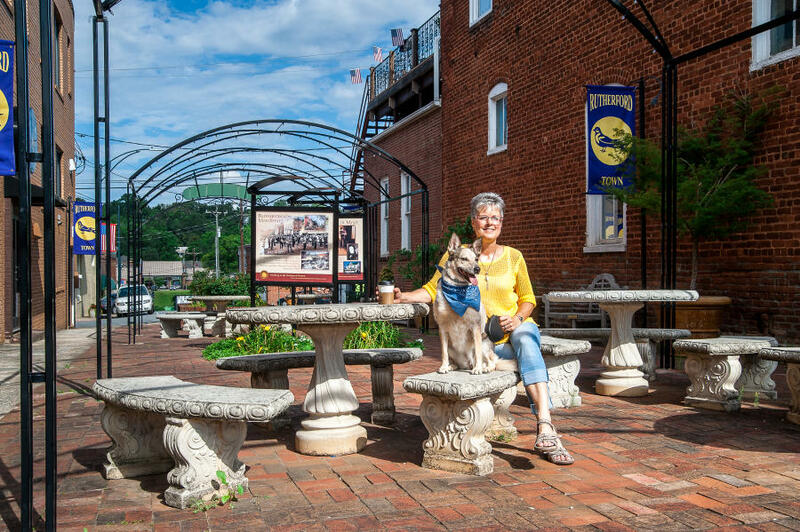 Main Street Park – For the feel of a somewhat urban picnic in the heart of historic Rutherfordton, tuck into this small open space decorated with planters, trellises, iron archways, benches, and a water feature. Local’s tip: If you’re in a time crunch, grab a to-go lunch from one of several nearby restaurants and simply relax for a few minutes of bliss. 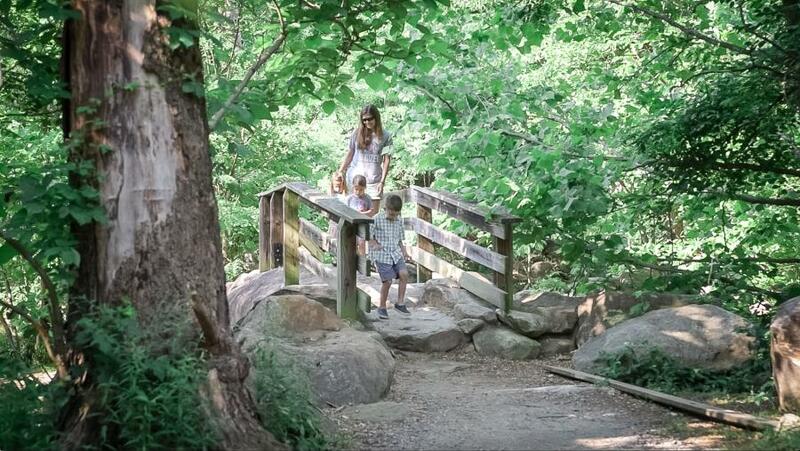 Chimney Rock at Chimney Rock State Park – With miles of trails, multiple scenic overlooks, wildlife, and even a 404-foot waterfall, Chimney Rock Park takes the picnic experience up a notch. There is a large pavilion in the meadows, as well as tables along the roadway and trails. You can carry your picnic along with you while you hike and find the perfect place to eat and relax. Local’s tip: We love the large deck overlooking Hickory Nut Gorge outside the Sky Lounge at the top of the mountain. Enjoy your own picnic there or order from their delightful menu! Dittmer-Watts Nature Trail – To get a feeling of being really away from it all without actually being away from it all, Dittmer-Watts fits the bill. 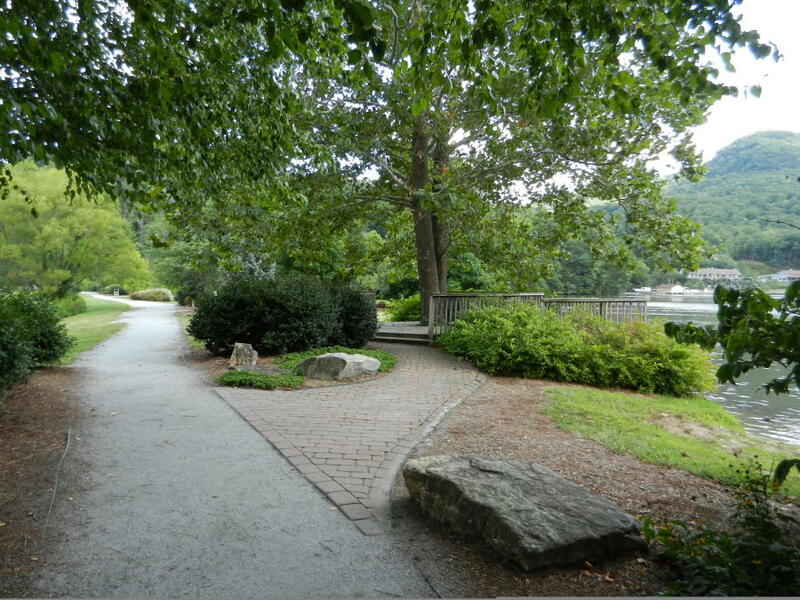 With plenty of picnic tables positioned all along an intimate network of easy to moderate woodland trails, this park is located within minutes of the shops and restaurants of nearby Lake Lure and Chimney Rock Village. Pool Creek Picnic Park – Pool Creek Picnic Park says it all. This park was designed for picnickers. It’s accessible by water or by land. Simply dock your boat, hop out, fire up one of the grills and enjoy the scenery. Morse Park – The only thing better than a picnic in a park is a picnic in a park with miles of crystal clear waters all around you. Morse Park is located next to the town marina and is the ideal spot for that traditional ‘throw a blanket on the grass’ kind of picnic. There are also several perfectly positioned picnic tables right next to the water. Local’s Tip: Want to get in a little fishing, kayaking or canoeing while on your picnic? Both Pool Creek and Morse Park are perfect for anglers of all ages. After lunch, rent a kayak, canoe or SUP at the nearby marina, located within walking distance from both parks. James F. Crowe Park – Just a few minutes’ drive from Forest City’s downtown area, Crowe Park offers picnicking areas in several locations throughout the park. It also features plenty of entertainment for the entire family. From baseball fields to a full playground area, there is bound to be a way to work off that post-picnic meal that satisfies everyone. Bubba O’Leary’s General Store & Outfitters – From picnic blankets, large beach towels, tumblers, tin cups, hammocks, and outdoor lawn games, a stop here will cross off the list several last-minute picnic must have items. Local’s tip– Before you head out to the parks, fill your cooler with ice-cold glass bottled drinks from the store’s antique fridge. 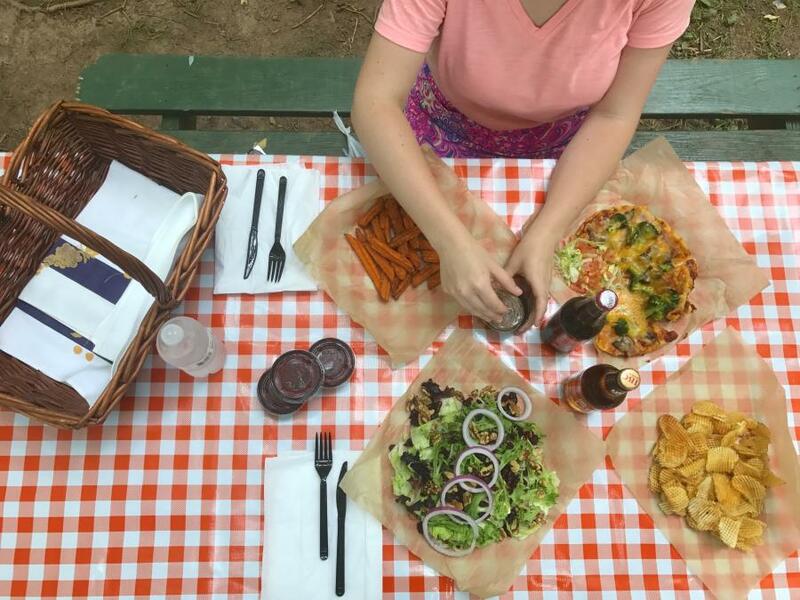 Washburn’s General Store –For the traditionalist, only a checkered tablecloth will do for your picnic. Not to worry, Washburn’s sells tablecloths by the yard. How’s that for customization? While you are here, you can pick up last-minute, unique condiments for your sandwiches and candies for the kids. For the truly ambitious, pickup an ice cream churn and make homemade ice cream on your picnic! Local’s tip– History buffs in your group will love a stop at Washburn’s Store. It’s on the National Registry of Historic Places. Short on Time? How about a Picnic To Go? Click here for a complete list of our restaurants. Click here for a complete list of our shops.